While probably late to the party, new large investors in single-family rentals embrace solid reasons for investing in this business model. Wall Street bought thousands of foreclosures during the housing bust. The capital from these investors absorbed the excess of foreclosures from the millions of borrowers who quit paying their toxic mortgages. Many observers believed this business model would fail. While apartment complexes enjoy economies of scale on maintenance and operating costs, dispersed single-family homes suffer from higher maintenance and management costs. Many early players in the REO-to-rental game exited the business due the problems critics warned about, but these smaller players were gobbled up by larger players with more efficient operations and lower capital costs. The industry matured over the last several years. The big players buy fewer homes and focus on managing their portfolios more efficiently. No large players entered this market since 2013 — at least until now. A big short is going long on the U.S. housing market. Mr. Mullen, the onetime head of Goldman’s mortgage-and-credit business, is now pitching pensions, endowments and other large investors on a wager that, four years after the housing market hit bottom, rents and home prices will continue to rise. This simple analysis identifies the wrong reasons why this plan will work. Lenders extend credit to borrowers with verifiable income and solid credit scores because these borrowers will sustain homeownership. Lenders rely on these prudent standards (prudent, not tight) to sustain their own profitability and the health of the housing market. The real reason rental occupancy rates will remain high is because Potential homebuyers can’t save for down payments with high rents. Persistently high rents plunge renters into a downward spiral where rents remain high because the number of renters remains high, preventing renters from ever saving enough to leave renting behind and become homeowners. Despite getting the reasoning wrong, if he finds capital cheaply enough, he will earn a solid return on his investment. But economists expect the homeownership rate to keep declining over the next decade due to tough lending standards and a younger generation of potential buyers mired in student debt and less compelled to own homes. The American Dream may be dead for the Millennial Generation. Not only are they saddled with large student loan debts, they endure weak income growth, and they face sky-high house prices needed to bail out the mistakes of previous generations. The grim reality confronting Millennials removes homeownership from consideration. Why should Millennials embrace a dream they see no way of achieving no matter how much they sacrifice? The timing of the effort could be tricky. After a six-year boom, the overall market for rental properties has slowed amid a construction boom in luxury apartments, with apartment rents in some big cities declining in the third quarter, the first quarterly decline since 2010. He’s like the college party goer who arrives at 11:30 and downs half a dozen shots to catch up to his friends. The time to enter the rental home market was five or six years ago. Even three years ago was too late. Other big investors are grappling with a changing market as well. Colony Starwood recently said that during the second quarter it sold 608 homes for an average price of about $132,000 while it paid an average of about $196,000 each to acquire 87 homes. Gardners prune the weeds for the health of the garden. Starwood sold the garbage for the health of its portfolio. Selling 608 homes isn’t a liquidation considering they own over 30,000 of them. Blackstone’s buying, meanwhile, has slowed to about 20 homes a week, according to a person familiar with the matter. I quit buying and selling homes in Las Vegas in 2012 because the inventory evaporated. It became nearly impossible to buy homes. By the time inventory came back to market, prices were so much higher that few compelling deals remained. Shevy finds the same dynamic in play in Orlando. The window of opportunity is closing there as well. The window of opportunity in this market is open a crack, but only investors with the lowest cost of capital can exploit the opportunity. * The gap between the rates of homeownership among the most educated and the least educated widened between 1995 and 2005, and then held steady from 2005 to 2015. * The portion of Americans who own their homes fell nationwide for all education levels over the last 10 years, even among the most educated households. * High school graduates have the same rate of homeownership–61 percent–as households headed by people who went to college but didn’t finish, even though the high school graduates have a significantly lower median household income. This month, we’d like to spotlight where home-ownership rates are dropping most–an equally alarming and informative portrait of the current state of housing. According to a second-quarter report released by the U.S. Census Bureau, the U.S. home-ownership rate is down to 62.9%–the lowest rate seen in the more than 50 years since 1965. In the chart we see some of the most depressed markets, like Buffalo, N.Y., and Cleveland, Ohio, that were once prosperous, but were hit severely by the financial crisis and advancement in technology; we also have places reaping benefits from tech industry’s unrivaled expansion, most famously, San Jose, Calif. This kind of thinking gave fools comfort when buying overpriced homes in 2005. Expensive assets are never the cause of a recession, but a symptom of excess capital and too few places to invest in corporate growth avenues. While many say we are headed towards another recession, no one knows just when. I don’t see an epic crash ahead as I don’t see any major factors that would cause such a crash. The issues that we have today such as high government debt, large deficits (budget and current account), slow wage growth, low consumer spending, and flat corporate profits have been baked into the market. Real estate investing is a long-term proposition. One does not usually do well by rapidly entering and exiting the market, as a market timer investor would. The best real estate investments are underpinned by strong fundamentals and require an investor’s sound, long-term perspective. This means that the investor must take a long view, spanning economic cycles. That does not suggest however it is wise to pay record high prices at the top of the cycle; rather, it means we should be prudently investing for the long-term. Nobody should panic, but everybody should start thinking about their exit strategies, and whether they plan to hold for the long term or not. The people who should worry right now are those that bought rentals with lots of debt and run a negative monthly cashflow. That becomes common late in a market rally. They are apt to get caught in a bind if the economy hits a soft patch and rents don’t rise or prices creep downward. They won’t want to sell, but the negative cashflow will be painful. Is Real Estate Finally Rolling Over? Amid all the epic financial bubbles that have emerged in the past few years, real estate has been a bit of an afterthought. Still, the action in hot market trophy properties has been pretty bubbly. This isn’t 2007 and these real estate markets aren’t collapsing. But the switch from strong growth to modest contraction is a big deal in the context of an economy where manufacturing remains weak, trade growth is slowing dramatically and corporate profits continue to fall. Combine a mild real estate recession with the bursting of the auto loan bubble and it’s not clear where the expected 3% growth as far as the eye can see will come from. Actually, that’s not true. It’s been clear for some time that the next growth engine will be old reliable deficit spending. Whoever is in charge a year from now will almost certainly be ramping up a major tax cut/infrastructure spending/debt relief program, paid for with either borrowed funds or newly-created dollars. Helicopter money, in other words. And no way will this be combined with higher interest rates (since the two effects would cancel each other out), so the talk of Fed tightening will die a quiet death very shortly. WASHINGTON (AP) — Donald Trump once called data “overrated” in politics. But with Election Day swiftly approaching, the Republican presidential nominee is spending millions of dollars on data and digital services in an effort to land donations and win over voters. Ushering Trump toward a more analytical approach are Jared Kushner, Trump’s son-in-law and adviser, and Brad Parscale, the campaign’s digital director and a veteran Trump Organization consultant. Both men — friends — are new to politics and have built a team largely without Washington operatives, whom they dismiss as overpaid and overrated. “People underestimate our data and digital because we haven’t been outspoken about what we’re doing,” Parscale said in an interview. Modern political campaigns gather up as much data as possible to raise money and identify, reach and turn out voters. They use voter registration files, commercially available information about consumer habits and beliefs, and much more. The most effective campaigns — think President Barack Obama’s — will arm their employees and volunteers with those analytics to knock on the right doors and make the right phone calls. Data also underpin effective media and digital outreach. “Digital” encompasses mobile apps, advertisements on websites, short videos on social media platforms such as Facebook and Snapchat, and more. The Trump analytics team has become increasingly confident in its work, saying the campaign has raised more than $150 million online and produces tens of thousands of different kinds of online content every day to keep up the cash flow and connect with voters. On big-news days — such as the debate coming Sunday — the team creates 100,000 pieces of digital content. Trump is up against Hillary Clinton’s seasoned team. Her director of analytics, Elan Kriegel, helped secure Obama’s re-election victory four years ago. Dozens of data analysts have toiled away at her Brooklyn, New York, headquarters since the first days of her campaign in the spring of 2015. The Clinton campaign also could be better positioned to make use of the data; as of August, she has more than 800 employees across the country, compared with Trump’s 130 employees and roughly 100 consultants. 2) The UST-bond is priced into the financial/business model. 3) The trade is susceptible to any type of macro shock; ie, recession; war. btw… if GS’s bet against housing was so lucrative, there would have been NO need for them to be bailed-out during the 08 financial crisis. If this guy raises money, he will help some of the early investors cash out with a healthy profit. He will provide the liquidity to make someone else’s trade a success, but he likely won’t garner the same results. Even the companies jumping into this in 2012 were late to the game in terms of modeling strictly for rental cash flow. I know because I was affiliated with one such company, and their rental investment fund fizzled because they couldn’t buy enough homes to scale up and still meet the requirements of their conservative model. They closed the fund after about a year and moved into distressed mortgage assets instead. However most of the hedge funds that jumped in from 2012-2013 with questionable models still got bailed out by major appreciation over the ensuing years. Anybody jumping in now is not going to benefit from the same appreciation, and the cap rates simply won’t be outstanding. There are still some marginal deals available, but not the great deals of the past. Unlike small time investors that are able to find deals below market value, these hedge funds are forced to pay full retail (sometimes over retail) to meet their quotas for home purchases. The opportunities that still exist for small time investors simply aren’t available for institutional buyers, IMO. The truly smart investors were the ones selling to the hedge funds in 2012-13 after picking up portfolios of properties for dirt cheap in the hardest hit cities from 2009-2011. There’s a guy on Bigger Pockets that sold something like 300 homes in Atlanta to hedge funds, and he made an absolute killing, doubling or tripling his money in a very short time. One of the things that shocked me in early 2012 was watching these funds buy houses at the auction site paying over full retail. They literally could buy houses off the MLS for less money. It finally dawned on me that they did this because it was the quickest and easiest way to deploy capital. They didn’t care what price they paid as long as they spent a lot of money. Individuals always have the advantage of being nimble to find deals, but when the big elephants move, everyone better get out of the way. The flippers who bought properties at auction in early 2012 got killed because they paid so much they couldn’t sell them quickly on the MLS and make a profit. If they held them long enough they did okay, but that isn’t a flipper’s business model. The rental building out in the IE is just insane. They threw up hundreds of apartments in West Corona, now doing the same in Chino Hills off the 71. Personally, I hope they crash rents in both areas. Probably an endless stream of renters though. Traffic is horrible as usual. Since they can’t build single-family homes at a price point people can finance, they meet the demand by building more apartments. California is becoming a state of renters serving the landed gentry. This is the first necessary step in that transition. Yes, this is the elite Dem/GOP business model based on mass third world immigration. Looks like the rental bubble popped ~Sept; ie., see recent REITs carnage for validation. Those are ugly charts. My guess is that investors are looking forward to the impact higher interest rates will have on the industry. While higher interest rates will probably cause more people to rent, they will also erode the returns on apartment developers who need access to cheap capital to finance their apartment complexes. This isn’t about mortgage rates, it’s about their future cost of capital. To paraphrase Mark Twain, reports of Sears and Kmart’s death have been greatly exaggerated.Or so says Eddie Lampert, hedge-fund operator and CEO of Kmart parent Sears Holdings. He penned a blog post this week dispelling rumors of Kmart’s imminent shutdown. The situation at Sears is dire. Ratings agencies Fitch and Moody’s have placed the company on the equivalent of a death watch. It has posted four straight years of losses, amounting to about $9 billion. It carries $3.5 billion in funded debt and $2.1 billion in unfunded pension and post-retirement obligations. It could burn through at least $1.5 billion annually, and it’s selling off some of its crown jewels just to stay in business. 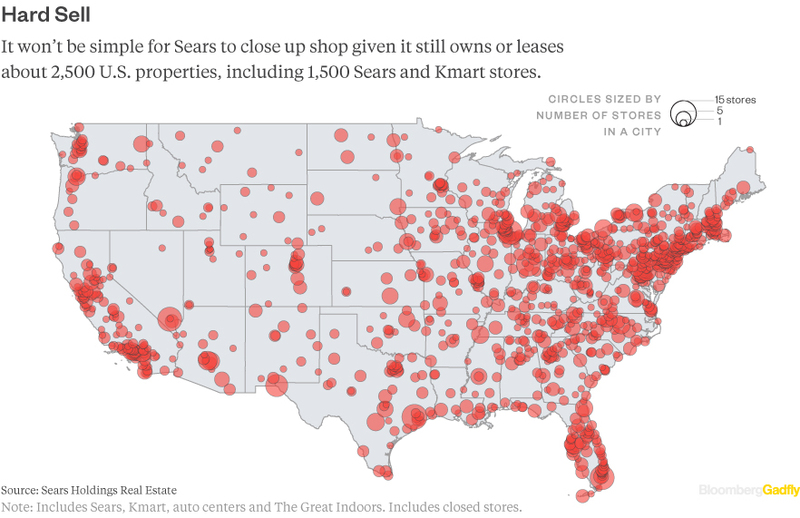 But as Gadfly wrote earlier this week, it’s not exactly easy for Sears to close up shop.As the map below shows, Sears still owns or leases 2,500 properties . That includes about 1,500 operating Sears and Kmart stores, as well as hundreds of auto centers, closed stores, and even a dozen or so vacant lots. For context, Macy’s currently has about 800 stores. Shutting the door on Sears would leave the country’s malls and strip centers littered with empty storefronts. Yes, Sears is already shuttering many of its stores. But it will take years to find buyers for all the real estate Sears owns and leases — especially at a time when department stores and other retailers are looking to shrink their footprint, not grow it. And as long as Sears stores are bringing in sales — the chain brought in $25 billion in revenue last year — vendors and mall owners will root for Sears to stay open just a little bit longer. Sears had about 4,000 a decade ago, after it merged Sears and Kmart stores. The count includes hundreds of Sears’ top properties, which the retailer recently spun off into a real estate investment trust called Seritage. South Coast Plaza probably would never have been built without Sears as the anchor tenant. I’ve never been able to verify it, but I had a business professor say they received a 100 year lease for $1 per year to guarantee they would stay with the mall. That’s how important Sears used to be. It’s hard to imagine now, since Sears is comparatively trashy when compared to the other tenants of South Coast Plaza, but without Sears and the success it brought to the mall, the entire arts district in Orange County wouldn’t exist. Segerstrom Hall was built on the fortune created by that mall. I overheard two the twenty-somethings in my office talking about Sears a few days ago. One of them didn’t even know what products Sears carried. He’d never been in any of their stores anywhere. I remember when having a Sears and a JC Penny as two anchors meant the mall was upscale. Now, it’s completely the opposite. If I see a mall with those two stores, I know it’s a zombie full of old people walking for exercise. Whereas today, if I see a mall with a Nordstrom, I know it’s full of pushy Asians and Muslims in burkas. The strange thing is Sears Canada marches right along. You go up there and go into one of their stores and they look nice, reasonably new, clean, etc. Canadians do not turn up their noses at Sears.